We believe you should have complete control and access to your accounts at all times. After all, it is your money. So with NB Online & Mobile Banking, you can bank how you want, when you want. And we know that for our customers who live across the country, and even for those residing close to us, visiting a branch is often an inconvenient exercise. Therefore, we’ve developed NB Online and Mobile Banking to be a true powerhouse and are constantly investing in its features and user experience. This focus on creating a convenient mobile-first financial platform has led to NB Mobile being one of the highest rated banking apps in the country. Designed to offer an incredibly powerful platform in an easy to use experience, NB Online Banking provides access to all of your finances within one portal. Available in the Apple iTunes and Google Play app stores, the NB Mobile Banking app is our flagship platform for personal banking customers. Enjoy full control over your NB Debit Card in a way you’ve never had before. Currently offered as a standalone mobile app, NB Card Controls is available for iOS and Android devices. An entirely new way to budget and control your personal finances, NB Money Management empowers our clients to have all their accounts and transactions in a single view, regardless of which institution the account or loan is with. By helping our customers streamline their finances, this is not only a helpful tool but an important resource of financial education. Once enrolled in the service, NB Text and Telephone Banking offers a quick and convenient way to access and manage your Needham Bank accounts. As you use your NB Debit Card, you’ll automatically begin receiving cash back reward offers from participating merchants. 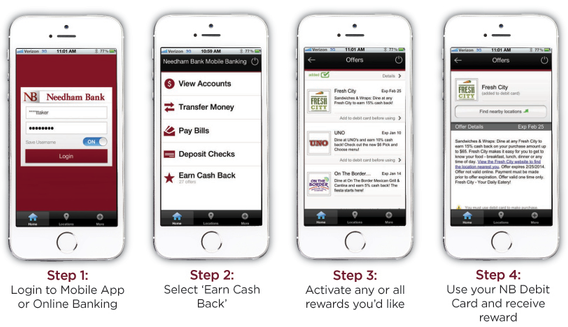 To review and activate these offers, simply login to NB Mobile or Online Banking and select "Earn Cash Back." Then simply use your NB Debit Card to make a purchase as outlined in the reward and automatically receive cash back. You are leaving the Needham Bank website. By clicking "Continue" below, you will enter a website created, operated, and maintained by a private business or organization. Needham Bank provides this link as a service to our website visitors. We are not responsible for the content, views, or privacy policies of this site. We take no responsibility for any products or services offered by this site, nor do we endorse or sponsor the information it contains. Continue to leave the Needham Bank site. Stay here to close this message.